In just 60 minutes your learning will target how to mass upload general journals from Excel to SAP S/4 HANA Finance using the new Fiori Finance Upload App. 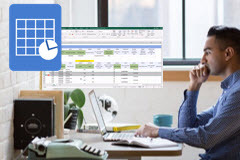 You will learn how to create the Excel template and upload single or multiple documents. No 3rd party or custom ABAP required. Excellent and great value training with amazing support. The best online training available.